Sometimes life throws us a curve-ball and we can’t make it home to meet the kids off the school bus, or maybe some unexpected cold front sweeps through while you’re away. With this auto home system homeowners can easily access their video monitoring system and watch what is happening live in their home when they can’t be there. Why restrict yourself to the convenience of use only when you are away? Use your cell phone from your bed to control the lights! As we have already covered, interactive home security can give you peace of mind that is simple and convenient. Being able to access your security system from a remote location to check on your home at any given moment is priceless. 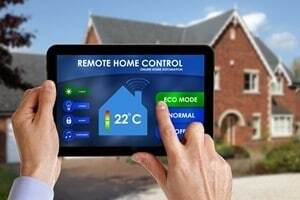 Some systems even allow you to interact with your home’s security, giving you the ability to disarm or arm your residence remotely using your smartphone. Complete home automation systems will also contact you by voice call or text if there is unusual activity at your home.